Toe drift, in which toes (usually 3rd, 4th and/or 5th toes) are visible from behind. 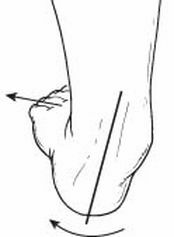 A tight Achilles tendon, which causes early heel lift during gait cycle and over time problems may worsen. Bunions, hammer toe, and Morton’s Neuroma may develop as a result of a flatfoot. The term flexible means that while the foot is flat when standing (weight-bearing), the arch returns when not standing. Note: A flat foot is normal in infants and toddlers, because the foot’s arch hasn’t yet developed. PTTD is usually progressive, which means it will keep getting worse and bony adpatation takes in a place causing arthritic changes in the major foot and ankle joints, especially if it isn’t treated early. Pain along the shin bone (shin splint). General aching or fatigue in the foot or leg. The symptoms of adult aquired flatfoot (PTTD) varies depending on the severity of the disease, but typically include pain, swelling, a flattening of the arch, and an inward rolling of the ankle. The area may be red, warm, and swollen. The foot and toes begin to turn outward and the ankle rolls inward. The area may be more red, warm, and swollen. The arch even more flattened. Severe tendon degeneration (no longer functioning). Bony adaptation (arthritic changes in foot and ankle joints). Activity modifications: Reduce weightbearing activities that cause pain and avoid prolonged walking and standing to give your arches a rest. Weight loss: If you are overweight, try to lose weight. Orthotic devices: We can provide you with custom-made full functional orthotic devices for your shoes to give more support to the arches. Immobilisation: In some cases, it may be necessary to use a walking cast or to completely avoid weight-bearing. Medications: Nonsteroidal anti-inflammatory drugs (NSAIDs), such as ibuprofen, help reduce pain and inflammation. Physical therapy: Ultrasound therapy or other physical therapy modalities may be used to provide temporary relief. We can work with our excellent in-house physiotherapists to offer you the best treatment. Shoe modifications: Wearing shoes that support the arches is important for anyone who has flatfoot. In some patients with flexible flatfoot whose pain is not relieved by conservative treatments, surgery may be considered. A variety of surgical techniques are available to correct flexible flatfoot, and one or a combination of procedures may be required to relieve the symptoms and improve foot function. In case a surgery is needed, Dr Hannah Chun will advise you on viable surgical options. Due to a progressive nature of PTTD, early treatment is advised. If treated early enough, your symptoms may resolve without the need for surgery and progression of your condition can be arrested. However, if untreated, PTTD could leave you with an extremely flat foot, painful arthritis in the foot and ankle, and increasing limitations on walking, running, or other activities. Orthotics or bracing: To give your arch the support it needs, we may need to provide you with an ankle brace or a custom orthotic device that fits into the shoe. Immobilisation: Sometimes a short-leg cast or boot is worn to immobilise the foot and allow the tendon to heal. Physical therapy: Ultrasound therapy and exercises may help rehabilitate the tendon and muscle following immobilisation. We can work with our excellent in-house physiotherapists to offer you the best treatment. Medications: Nonsteroidal anti-inflammatory drugs (NSAIDs), such as ibuprofen, help reduce the pain and inflammation. Shoe modifications: Your foot and ankle surgeon may advise changes to make with your shoes and may provide special inserts designed to improve arch support. In cases of PTTD that have progressed substantially or have failed to improve with non-surgical treatment, surgery may be required. For some advanced cases, surgery may be the only option. Dr Hannah Chun will determine the best approach for you.